I love a great variety of foods for lunch and dinner, but for some reason I get stuck on one breakfast and can’t let go. Maybe I’m such a one-note breakfast wonder because, as a general rule, I can’t put two coherent thoughts together before 10:00 A.M. Last year’s breakfast was coffee with a side of a few raw almonds and dried cherries. Then I’d have an additional snack of PBJ toast as soon as my pre-frontal cortex came online enough to trust myself with a toaster and a knife. Lately, I have been on a salted caramel banana nut smoothie kick for breakfast, a recipe I invented and posted about a month ago, and have made every day since. Sometimes I shake things up by subbing ½ cup of coffee for ½ of the almond milk. So I was lying in bed the other night thinking of my new love for things salty caramely, fruity and sweet when I literally sat up, struck with a food idea. I grabbed a pen, turned on the bedside lamp and wrote down “pretzels,” “peaches,” “caramel” and “ice cream.” I could taste the combination in my imagination: the salty, the sweet, the warm caramel, the cold ice cream. 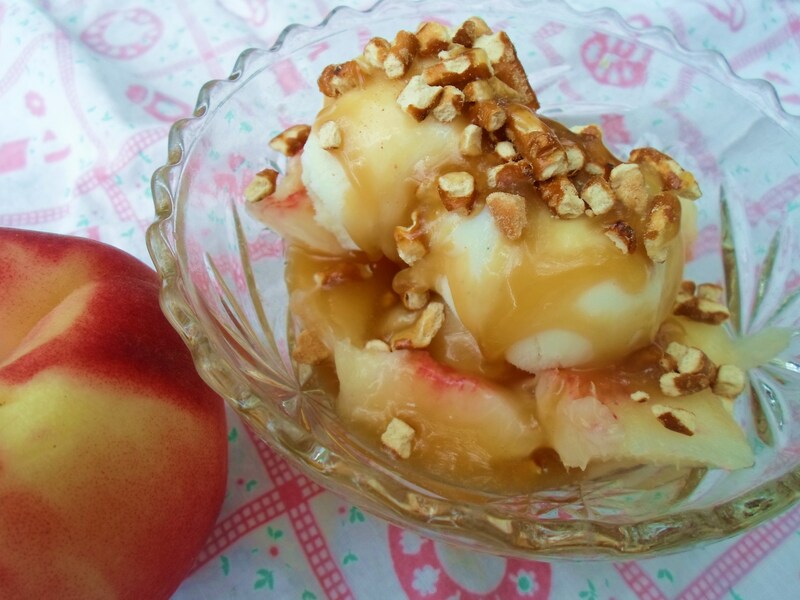 I went to sleep dreaming of the perfect peach sundae. Sure enough, my imagination proved accurate. I love this sundae, perhaps a bit too much. It is taking a lot of will power not to make it my new daily breakfast. 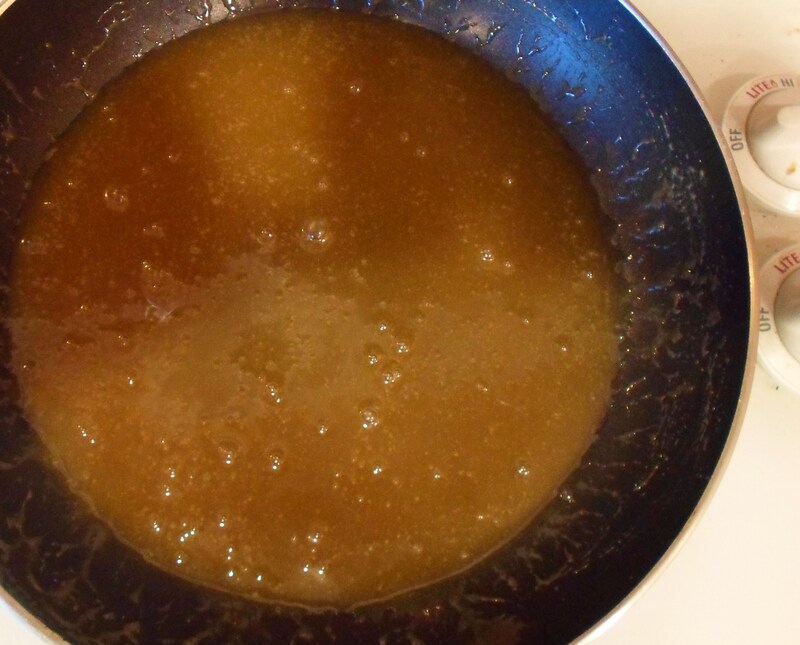 To make quick caramel sauce, melt butter in small saucepan, then add brown sugar and cream or half-n-half. Stir and simmer until sugar has melted and smooth syrupy sauce forms. It doesn’t take long, just a minute or two. Take off heat and let cool. 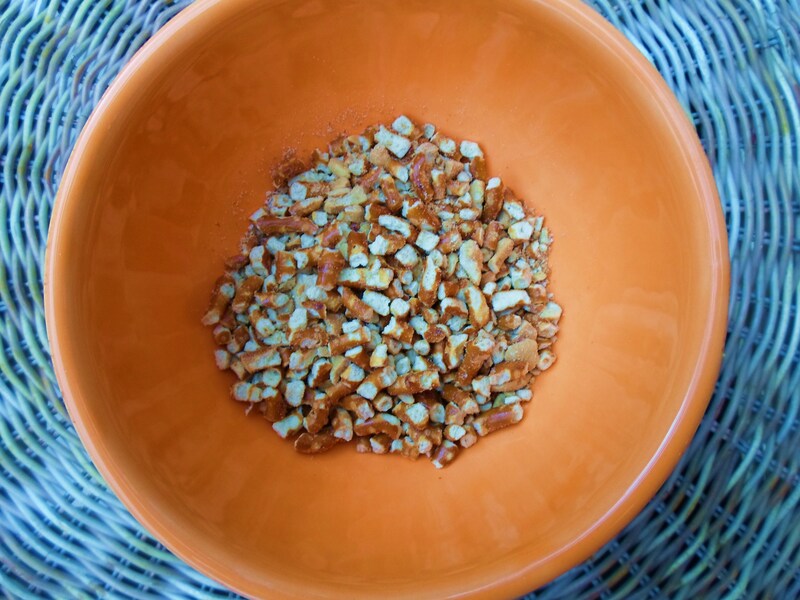 In a blender or food processor, chop pretzels and nuts together, until they are the size you want for sprinkling on top of the sundaes. 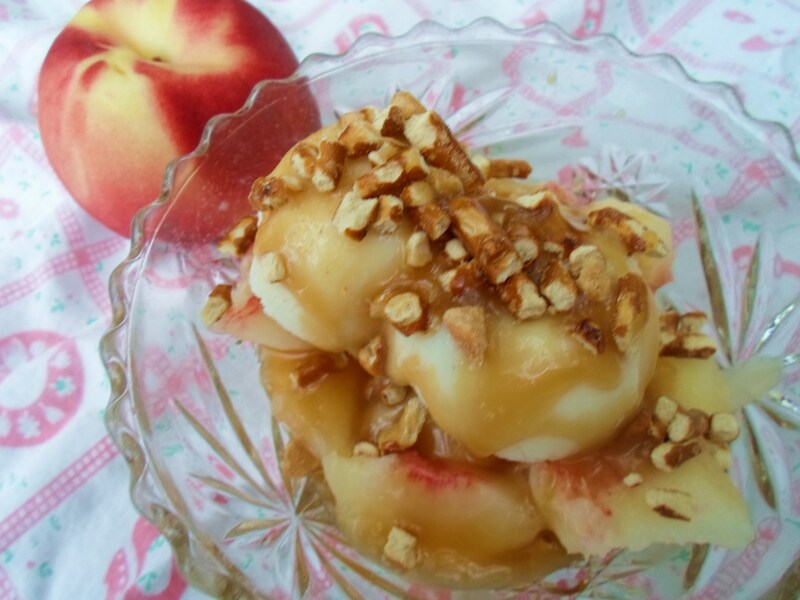 Into each of two pretty dessert bowls put 1 sliced, peel, chopped peach. 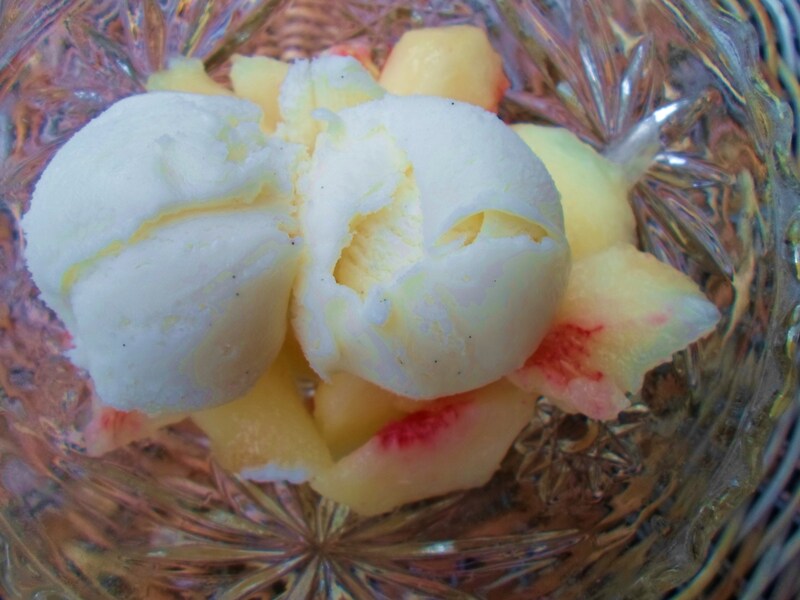 Place a generous scoop of vanilla ice cream on top of this (or two small scoops as pictured). Variations: Try bananas, pineapple or strawberries or other fruit. 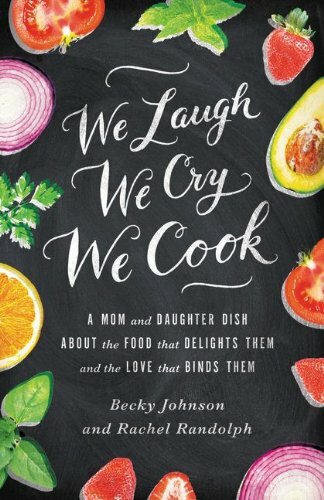 Try other flavors of ice cream or Rachel’s vegan soft serve recipe. I think a combo of strawberries and cheesecake or white chocolate ice cream would be heavenly. 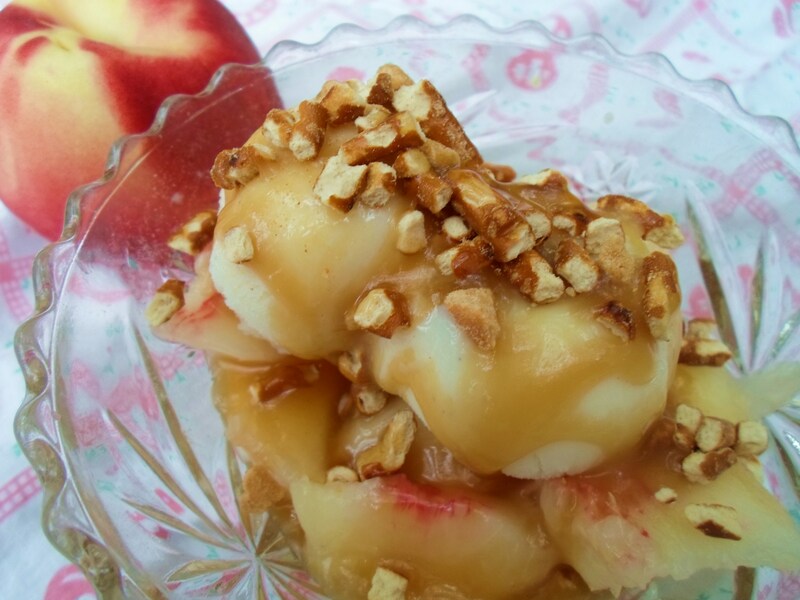 You can also skip making your own caramel sauce and use a bottled variety of your choice.